Things have been busy here in the Just Bubbly Soap Shop! We are working 7 days a week to get all the orders out to our fabulous retailer so they can stock their shelves with all the holiday soaps & gift items from Just Bubbly! But.......as promised we will be appearing at several retail venues this season so that our local retail customers can pick up all the gifts they need without paying for shipping! I have just uploaded some of the new shows where we will be this Fall. We are still adding shows and would love you input as to where you would like us to be! If there is a fair or festival that you believe we would be welcome please let me know! You can email me at info@justbubbly.com or message me on our Facebook page! We are always looking for new venues to showcase our products at! I will be adding more shows as they become available! Keep checking and keep suggesting!!! Just Bubbly Announces Monthly "Rescue Adoption"
As many of you know - I am a die hard animal advocate. I rescue, care for and help those who help the unfortunate furkids that find themselves homeless. The poor NYACC kitties and doggies tear at my heart each time I see one who will more than likely die before their time because they have no one to save them. Every night their innocent faces haunt me, I pray for angels or for someone, anyone to please save them. Some are sick and in need of vetting, some are surrendered by their families because they have been evicted from their home, some are there because their human has died and there was no provisions made for them, some are simply labeled as "stray" and others are just abandoned and dumped by the human they thought would always protect them. What can be done to help these poor sentient beings???? So I thought & thought & decided that Just Bubbly will start a "rescue adoption"-every month we will donate 25% of ALL animal related retail sales to a rescue group. This includes ALL items on our website that have ANY connection to animals! Honey Bear Bubble Bath, Dinosaur Soaps, My Pet Fish are ALL included!!! Every month we will select from those rescue groups who have expressed interest in being "adopted" and 25% of ALL retail sales will be donated to their rescue. In addition to the 25% we will create a custom soap with the logo for the rescue adopted and donate 20 soaps to them for them to distribute/sell or give as gifts. Check our Fan Page at Just Bubbly to see who we have selected every month. We will begin with our first rescue in May, 2011. 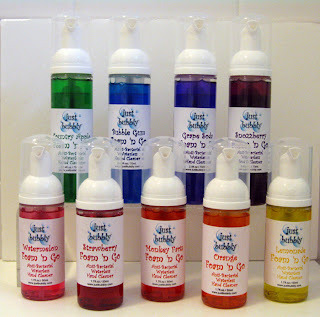 Just Bubbly is a small, handcrafted bath & body company who DOES NOT test on animals, nor do any of the suppliers we buy from. While our donation may be small it is my hope that it will make a difference in the life of some poor sentient being hoping to live another day. While our monthy "rescue adoptions" will primarily focus on those rescues who pull animals from the euthanization list at NYACC we will consider any group that is dedicated to saving the lives of those furbabies who have been left at shelters. 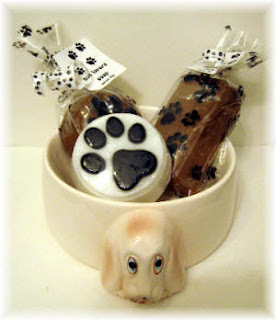 It is my hope that this will help save the lives of some of the poor furkids that have found themselves homeless. If you are a rescue interested in becoming one of our "Adoptees" or if you know of a rescue that will benefit please message me and let me know and you will be added to the list of approved rescue groups. Please feel free to share this note with any rescue who may be interested. January was a busy month for Just Bubbly! We closed up our shop at The Holiday Shops in Bryant Park for the season and moved into wholesale mode three days later at the Philadelphia Gift Show. Business was brisk and buying was good - the weather wreaked havoc again as we awaited the arrival of yet another ice/snow storm. Making their debut at the Philly show were the new Just Bubbly Inspiration Soaps. Perfect for a Serenity gift, friendship area or any section of your shop where inspiration is needed and words can describe! Individually handcrafted from our famous high quality goatmilk soap and lightly scented with a milk & honey fragrance, these are sure to be a wonderful addition to your shop. The words are embedded into the bar of soap and will last for the life of the soap then dissolve. Chose from a wide assortment of our inspriational words or chose your own. After the Philadelphia show we moved on over to the New York International Gift Show where once again the weather was not our friend! Lots of interesting and anxious to spend buyers flooded the show the first two days - then.....the ice storm came and the buyers left leaving us with tons of followups to make to all those shop owners who "flew" through the show like lightening so they could get home before the storm. the good news is that orders from those buyers started to come in evern before we closed the show! You can look for Just Bubbly Handcrafted Bath & Body Products at many of your favorite retailers across the US! Well that's all for now - I will try and post more new products and introduce you to the new JB Greek line of licensed sorority soaps and bubble baths! Polls are open for March! Nominate Just Bubbly for the Love A Local Business Grant and watch us GROW! The Voting is open for March! If you love Just Bubbly and our products show that LOVE! PLEASE post your comment and nomination for Just Bubbly. We were sooooo close for February! If you commented in February - please re-nominate for March! Thanks to all our fans! Your support is appreciated! It's been a while since I have posted to the Just Bubbly Blog, but that could be in part because I have been so very busy creating items for our booth at The Holiday Shops at Bryant Park. While some people say that we are in a deep recession, my lack of posting and sleep will beg to differ with you. Our shop has been buzzing, every day all day since we opened in early November. Yes there have been slow days and days where the weather has kept buyers at bay but those days are few and far between. After being in business for over 25 years I feel that I can attribute much our success at Bryant Park this year in part to the fabulous management team that Upsilon Ventures has assembled. The efforts that have been put into this years Holiday Shops are apparent every where you turn. The recent addition of Natasha as marketing strategist has been one of the many reasons we have been seeing the increase in traffic at the Park that we have seen. Natasha works day and night with all the vendors to maximize their marketing opportunities through the use of Twitter, Facebook, and Blogger as well as the press and media to bring the best of the best to the general public's attention. We were even mentioned in the New York Times! Natasha and Ariana have coordinate Tweets about sales, events and other vendors of interest every weekend. Then there is Deb who is "faceless" to most because she works tirelessly behind the scenes handling any and every issue that may arise and answering every question anyone can think of. If there is ever a problem we can be confident that a call to Deb will get it all straightened out pronto. Overall I must say that I am extremely pleased and impressed by the professionalism, courtesy and cooperation that is Bryant Park this year. From Natasha and her Social Networking magic, to Deb and her amazing organization ability, to Joe who makes sure that everything is top notch and in perfect working order for the vendors to Frank who is everywhere at once for everyone who needs him and all the others who we never see or hear about - I must say thank you. This year is proving to be the best yet! Frank.....you have done an amazing job - I sure hope you can some sleep this January! So if you are in the area and looking for some great shooping opportunities stop in to Just Bubbly's booth C-14 on the corner of "fountain" and "rink" (near the corner of 40th & 6th Avenue) and take advantage of our discounts for teacher, military and Citi Bank members. Many of you know me and my passion for all animals, but especially for my dogs. I believe that you can truly tell a lot about people by the way they interact with other species of beings. I have raised my two children to have the same respect and compassion for all living beings that I have. I believe that if we try, we can live in a world without homeless pets. I believe that an animal offers you unconditional love. They don't care if you have money, wear old clothes, live in a fancy house or drive a fancy car. They find joy in the things that we often cast away. They ask for nothing from you but your love. So when I was sent this video I watched it over and over again. The message in this video is so clear. I doesn't matter what faith or religious path you follow this little video will touch you. It is an amazing song and video reminding us of the connection between dogs and God...much more than a word play. A very sweet video that will bring a smile to your face. I don't usually foward emails that were sent to me or post things from these emails, but this little bit of info is worth sharing. We are going through hard economic times, unemployment is it's highest since the Great Depression. People are losing their homes at record pace, more and more family pets are being abandoned to shelters and even being left to suffer with no food and no water inside of foreclosed homes. As you know, Just Bubbly is a small American based business which creates handcrafted, unique bath & body products right here in the USA (more specifically the shores of Rockaway)and I am always promoting and buying products that are made in America. Here is a little info from an email that was sent to me today from a friend and fellow crafter. She challenges all of us to Buy American! "In our current economic situation, every little thing we buy or do affects someone else and perhaps even their job. So, after reading this email, I think this lady is on the right track. Let's get behind her!! My grandson likes Hershey's candy. It is marked made in Mexico now. I do not buy it any more. My favorite toothpaste Colgate is made in Mexico now. I have switched to Crest. You have to read the labels on everything. This past weekend I was at Kroger. I needed 6 light bulbs and Bounce dryer sheets. I was in the light bulb aisle and right next to the GE brand I normally buy was an off brand labeled, "Everyday Value." I picked up both types of bulbs andcompared the stats - they were the same except for the price. The GE bulbs were more money than the Everyday Value brand but the thing that surprised me the most was the fact that GE was made in MEXICO20and the Everyday Value brand was made in - get ready for this - theUSA in a company in Cleveland , Ohio . So on to another aisle - Bounce Dryer Sheets....yep, you guessed it, Bounce cost more money and is made in Canada . The Everyday Value brand was less money and MADE IN THE USA ! I did laundry yesterday and the dryer sheets performed just like the Bounce Free I have been using for years and at almost half the price! Let's get with the program.... help our fellow Americans keep their jobs and create more jobs here in the U.S.A. !!! Life isn't about how to survive the storm, but how to dance in the rain." I think this really speaks for itself. And now we have to make the soap (and all the other stuff)! Yesterday was the last day of the New York International Gift Show. It has been a long 30 days for me, traveling from Philly to the New York shows. If the New York and the Philadelphia show are any indication of the where the economy is heading, then there is a light at the end of the tunnel! Sales were brisk and plentiful. Buyers were buying without hesitation. Customer confidence and spirits were high. The buyers for both shows were out in full force, all looking for the newest and greatest items to fill their bare shelves with for now and the Fall/Winter '09 season. Philadelphia brought out record numbers of buyers from as far away as Virginia and Delaware. Buying trends in Philly were for immediate delivery as well as Holiday. 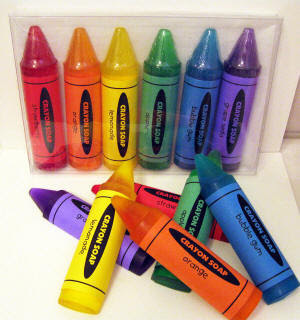 Biggest interest at the Philadelphia Gift Show was our ever expanding Back To School Educational Line including the newest editions of Crayon Soaps and antibacterial Foam 'n Go. The New York Show brought international buyers from as far away as Russia! You got it - Just Bubbly will be found in retail shops in Russia this Fall! Also Panama, the Dominican Republic and other far away lands. Domestic buyers at the New York International Gift Fair included many from California, Texas, Illinois and Washington state. East coast buyers as usual were out in heavy numbers. I enjoy the trade shows, they give me the opportuntiy to interact with my customers and get valuable feedback from them on buying trends and the wants and needs of the retail customers. At the NY show I was so glad to see so many of my wonderful customers like Ellen from Soapmarket in New Jersey, Courtney from The Blue Horse Boutique and Kevin from MXYPLYZYK in New York to name a few. I also get to see some of my old exhibitor friends like Ronnie & Jerry of the Puppet Workshop, John & Alma of Almas Designs, Kristel & Andrea of Semaki & Bird and so many others who I have grown to be very good friends with after 25 years of trade shows. Funny how time marches on - through all these years of trade shows, our children have been born, grown up and are now adults. I can still see Kristel from Semaki & Bird working at the shows pregnant with her daughter Grace who is now 8 years old! Our children have grown up together and our friendships have survived the test of time. Working at the trade shows is not easy. The days are long and tiring. Both the buyers and exhibitors fight the clock - how to get ALL the shopping done in only a few days. We exhibitors stand all day, talking about product, trends and ideas with buyers and other exhibitors. Buyers walk miles of isles looking for the perfect products to fill their shelves. Twice a year we meet to look at the past and try and predict the future. Some of my best product ideas have come from customer chats at the gift shows. While I am glad the shows are over, I am also sad that it will be another 6 months before we all meet again! Foam 'n Go Antibacterial Waterless Hand Cleaner a must for Back To School. New for Back to School is our Foam 'n Go Antibacterial waterless foaming hand cleaner. Back to school means back to dirty hands! Be ready for the back to school rush and shared germs. With the health agencies forecasting a major return of Swine Flu (H1N1) this fall, the CDC says "Clean Hands Save Lives." Our Foam 'n Go Antibacterial Waterless Foaming Hand Cleaner is a must for every students lunch box and is also a great idea for keeping in your grownup purse or backpack. Not only is it perfect for lunch boxes and backpacks this cleaner is a must for all kids and adults alike! Keep one anywhere you need to assure you can have clean hands. On your desks at work, in bathrooms, your cars, outside in your yard, even pack one for the beach! We made it practical and fun as usual! 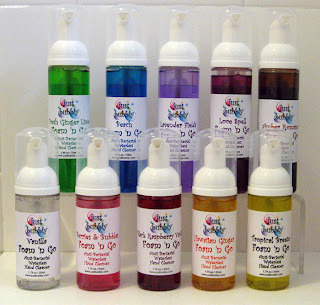 Packaged in a clear pump container, Foam 'n Go is available in 2 sizes - 50ml (1.7 oz.) and 75ml (2.4 oz.) and comes in Kid friendly scents like Strawberry and Grape Soda and not just for kids scents like Beach and Pink Grapefruit. Simply place "one pump" of foam onto dry hands. Rub hands until gone. This is a no rinse hand cleaner making it perfect for after lunch clean up. Contains active ingredient Benzethonium Chloride in addition to Aloe Vera and Vitamin E. Complete in covered pump top foaming bottle, children will enjoy cleaning their hands while stopping the spread of bacteria. Order early so you are sure to have your for the first day of school! Summertime, Summertime Limited Edition Time! Summertime is almost here and what would summer be without Watermelon? So to answer the call (the call from our product tester Julien that is!) we have added some limited edition soaps, bubble bath and foaming soap to our ever growing line of unique handcrafted bath and body products. For a limited time only you can experience our new Scrumptious Watermelon fragrance. This newest fragrance addition will WOW you with wonderful, mouth watering notes reminiscent of this sweet summertime fruit. 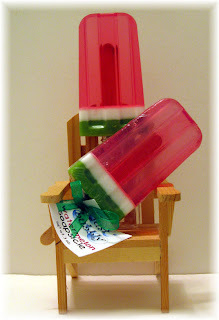 Watermelon Frenzy will remind you of a watermelon Jolly Rancher candy! We are offering this seasonal fragrance in Honey Bear Bubble Bath, Foaming Soap and our famous Designer Soapsicles. It's been a while since my last post and as you can imagine things have just been bubbling around the shop. Right now I am sitting in my hotel room getting ready to head back to New York after a fun filled 3 days at the HSMG annual conference. This year our conference was hosted in Palm Springs California at the Miramonte Resort. What a wonderful place in the middle of the desert. It was 100 degrees most days but there is no humidity so you don't really feel it. The conference brings together once a year a group of soapmakers (yes soapmakers) who don't look at each other as competition, but friends. I look forward every year to spending time with my very good friend Monique Hodgkinson from Stable Solutions and comparing notes on everything from soapmaking to kids. This year I finally got to put a face to the name of some people who have become very good friends through some really cool networking. Cindy Tollen from Sudz N Bubbles is an MP soapmaker like me and makes the cutest and coolest pie soaps. These slices of pie look and smell like the real thing and they even come in a plastic pastry box! Really cool for a summer gift. Another face to a name came 2 days into the conference when FINALLY I found Marla! Marla Bosworth is also an MP (melt and pour) soapmaker and her niche is seashore themes items - she is the creative force behind Backporch Soap in Duxbury Bay, Mass. Marla makes the most gorgeous sea glass soaps you have ever seen - they look so real you would think they were glass! Marla also teaches soapmaking (she has the patience of a saint!) and offers workshops in other business areas. Also here with us is my New York friend Delores Harris from Daisy Mae Natural Soaps who specialized in CP (Cold Process) soaps that are all natural. There were so many others here that I could go on forever! But.......this conference brings together, every year, a group of soapmakers (male and female) who share the same interest, business and yet are so very different. It took me an entire day to get here from New York. I left JFK at 6am on Tuesday morning after an amazing day on Monday proudly watching my daughter walk across the stage at Radio City to complete her Masters Degree from NYU. She became the first member of our family to reach that level of education. I landed in Salt Lake City and had to run across the airport to catch the connecting flight to Palm Springs. When I got here the conference was well under way and everyone was having lunch on the lawn. Old friends, new friends, veteran soapmakers, novice soapmakers all came together in one place to share, network and just have fun. It was wonderful and I can't wait until next year in Denver! Meet Our Newest Product Tester! As many of you know, both of my children are grown now and have little or no desire to try and test any of our unique, new and exciting products. I have been looking and searching high and low for what seems to be forever for another dedicated product tester. Well recently I was cyber-introduced to a fantastic young man (and his fantastic mom) who graciously agreed to accept the position. I would like to introduce all of my friends, readers, followers, retailer customers and wholesale customers to our newest member of the Just Bubbly Team, Julien Collot. Now Julien is not just your ordinary product tester. He is dedicated, knowledgeable and consciencous. Just look at the intensity on his face as he tests our famous Foaming Hand Soap. 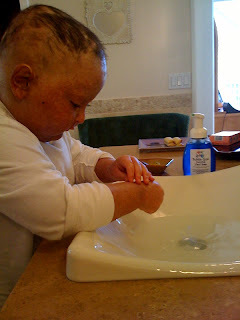 According to his mom Jackie "he really loves it, smells great- (he usually HATES washing...especially because the soaps are so hard on his skin BUT YOURS ISNT!!!" So far Julien has tested and approved of the Bubble Gum Foaming Hand Soap and the Alphabet Soaps which his mom Jackie recalls when he first tried them out. "He just called me into the bathroom to show me that he lined up the whole alphabet! They smell like "fruit loops" the "bubble level" is perfect for him- he cannot do too soapy- he cannot handle anything drying out his skin even more." You see, Julien cannot use any products on his skin that are harsh and drying because his skin is already extremely dried and sore from the Graft Vs. Host Disease he is currently fighting. Prior to that Julien also had cancer. Since the age of 3, 5 year old Julien has battled an aggressive form of leukemia (AML) which is rare in one so young. The kind of cancer that Julien had is so rare that cancer researchers have barely started to focus on a cure. Yet he greets every day with a smile and a positive attitude. I am truly honored to have Julien join the Just Bubbly Team! If you would like to read more about Julien just visit http://www.juliencollotfoundation.org/. And....if you would like to send Julien an email and ask him some product questions, or questions about any of his other interests you can reach him at jujutransformer@aol.com. Welcome aboard Julien!